This storywas updated at 12:42 a.m., Nov. 26. Two NASAastronauts and a Russian cosmonaut safely returned to Earth tonight after afive-month-long stay at the International Space Station. AmericansDouglas Wheelock and Shannon Walker, and Russian cosmonaut Fyodor Yurchikhin,landed in their Russian Soyuz TMA-19 space capsule on the central steppes of Kazakhstan on Nov. 25 at 11:46 p.m. EST (0446 GMT on Nov. 26). 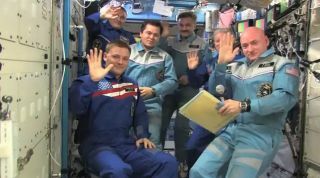 Thespaceflyers appeared to be in excellent spirits, and were all smiles as they were extracted from the Soyuz. Yurchikhin was first to be helped out of thecapsule, followed by Walker and then Wheelock. Russian searchand recovery forces presented Walker with a bouquet of flowers after she wasremoved from the spacecraft. While being tended to by recovery teams, Wheelockheld up a sign that said ?Hi Mom,? and smiled broadly for the cameras. Wheelock,Walker and Yurchikhin wrapped up the five-month mission at the International Space Station,where they completed scientific experiments and performed general maintenanceactivities for the orbiting laboratory. Wheelock even executed three emergencyspacewalks with his crewmate, Tracy Caldwell Dyson (who returned to Earth onSept. 25), to fix one of the station's vital cooling pumps after itmalfunctioned in mid-August. Walker and Yurchikhin assisted in the repairefforts from inside the station. The triolaunched to the space station on a Soyuz rocket on June 15. While living aboardthe orbiting outpost, Wheelock actively engaged in social media, using Twitter to post stunningpictures taken from 220 miles (354 kilometers) above Earth. After monthsin space, however, returning to Earth will have its perks. "I'm justreally looking forward to the simple things," Wheelock said. "Probably the biggest thing I'm looking forward to is hot, running water ?taking a shower. I haven't had a shower since June, so I'm looking forward tothat. And really looking forward to feeling a breeze against my face, justsmelling the Earth and all the vegetation, and experiencing the feel of theEarth again." Still,Wheelock was quick to reflect on the lasting impact of a long-duration stay in space. "Itreally makes you feel quite insignificant in the whole scheme of things, butreally makes you turn inward to define yourself and your purpose,"Wheelock said. After landing,the returning spaceflyers will be retrieved by a recovery team and flown to Kustanai, Kazakhstan. From there, Yurchikhin will return to Russia's Federal Space Agencyheadquarters in Moscow, while Wheelock and Walker journey back to NASA'sastronaut headquarters at the Johnson Space Center in Houston. The Soyuz landing, originallyplanned for Nov. 30, was moved up a few days to avoid conflicting with thestart of the Organization for Security and Cooperation in Europe summit, whichis being held in Astana, Kazakhstan, Dec. 1 and Dec. 2. The meeting willattract heads of state from around the world to discuss international securityissues. With theirdeparture, Wheelock, Walker and Yurchikhin left behind their fellow stationcrewmembers: NASA astronaut Scott Kelly and cosmonauts Oleg Skripochka andAlexander Kaleri. The space station will be home to only three people untilmid-December, when NASA astronaut Catherine Coleman, European astronaut PaoloNespoli and Russian cosmonaut Dmitri Kondratyev arrive to round out theoutpost's Expedition 26 crew.